The 2012 Big Sit Results! The Metro Munchers at their Big Sit circle in Harrison Twp, MI. 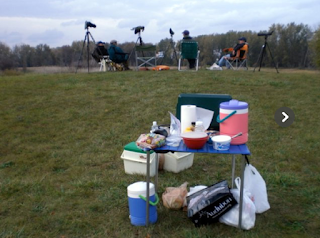 The annual tailgate party for birders known (officially) as The Big Sit! has been held each October since 1990 under the auspices of The New Haven Bird Club (the organization that holds the trademark to the name The Big Sit!). If you're not familiar with the concept of a Big Sit, this link has a good explanation. 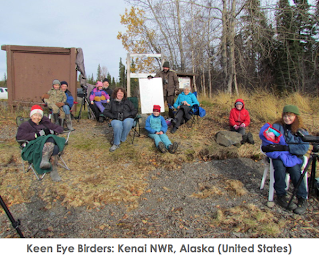 Basically Big Sit participants spend as much of 24 hours as they can stand bird watching from inside a 17-foot diameter circle in some birdy spot. In 2012, there were 233 registered Big Sit circles worldwide, most of them in the United States and Canada. But there were also circles in Panama, Sweden, Mexico, and South Africa. The braggin' rights for highest species count among all North American Big Sit circles in 2012 goes to to The No Bullsitters who were sitting at Cape May Point State Park on the southern tip of New Jersey. They had an astounding 132 species! Wow! There were Big Sit circles in 40 of the 50 US states, begging the question of what the heck is WRONG with the 10 states with no Big Sit? [AR, HI, KS, KY, WY, TN, RI, NM, NV, MT]. A few of these have hosted Big Sits in the past so perhaps it's just a matter of not submitting their results. Here is a list of all the registered circles for 2012. And here is a link to lots of other stats for the 2012 Big Sit. Here at Bird Watcher's Digest we love The Big Sit so much that we've been the promoters and data keepers for it since the 2002 event. Four years prior to that the good folks at Swarovski Optik became the sponsor of The Big Sit's only annual prize: The Golden Bird Prize. The Golden Bird Prize is a $500 cash award given to the winning team to apply/donate to a conservation cause/organization/project of their choice. Here's how the winning team is selected: At their annual winter meeting, the New Haven Bird Club randomly chooses a North American bird species from among all the species recorded on all the North American Big Sits. Then all the Big Sit circles that recorded that bird species are placed into a hat and one lucky team's name is drawn as the winner of The Golden Bird Prize. The species selected for the 2012 Golden Bird Prize was the sedge wren. From among the Big Sit circles that saw a sedge wren on the 2012 Big Sit, The Wheeler National Wildlife Refuge "Wingers" lead by Dwight Cooley, were selected as the winners of The Golden Bird Prize. The sedge wren was the species selected as The Golden Bird for the 2012 Big Sit. The Wingers had a very "wrenny" Big Sit, recording four wren species among their total: house, sedge, Carolina, and marsh wren. The Wingers plan to donate the $500 prize money from Swarovski Optik to the Wheeler Wildlife Refuge Association. This association, established in 1998, is an advocate for the Wheeler NWR complex and the National Wildlife Refuge Association. 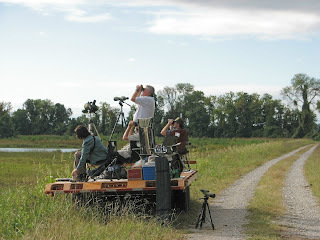 In addition, they sponsor and support many conservation and education projects on the refuge. The Wingers have held a Big Sit at Wheeler NWR in Alabama for many years. 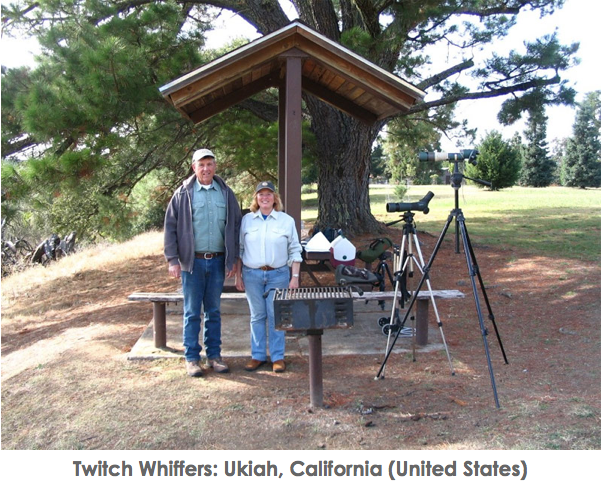 Congratulations to Dwight Cooley and the Wingers for their winning effort at Wheeler NWR in Alabama during the 2012 Big Sit. The 2013 Big Sit will be held on the weekend of October 13, 2013. You can watch the official Big Sit web page for announcements and the opening of registration. I'm going to write about our own 2012 Big Sit here at Indigo Hill in one of my next posts and explain how we doubled our fun, if not our list of birds. Until then, stay birdy my friends. My interview with Ben Lizdas of Eagle Optics was just too meaty to include in a single podcast episode, so we broke it into two parts. And this new episode, which is number 40 in the "This Birding Life" podcast archives, contains the second half of our conversation about getting good advice when buying birding optics. Ben and the folks at Eagle Optics are super experienced in guiding customers through the buying experience. Ben Lizdas of Eagle Optics. 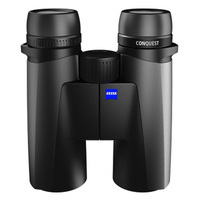 In this episode we discuss some considerations for specific types of use: hawk watching, shorebird watching, warbler watching, backyard feeder watching as well as parameters for choosing the right binocs for traveling, hiking, and the proper binocs for use by young bird watchers. 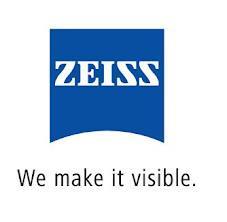 Special thanks to Zeiss Sports Optics for sponsoring "This Birding Life." If you'd like to meet Ben Lizdas and sample the very best in birding optics for yourself, make plans to attend the Birding Optics & Gear Expo, March 23-24, 2013 at the Grange Insurance Audubon Center in Columbus, Ohio. Eagle Optics will be there along with reps from the major optics manufacturers. It will be a great opportunity to try before you buy. Registration is FREE and all registered attendees will be entered to win one of our fabbo door prizes. 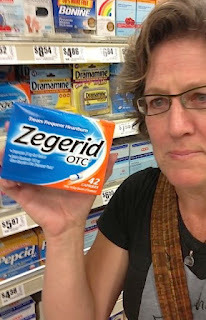 I'm pretty sure we've found a new product that's guaranteed to get rid of pesky artist/naturalists, but we need a caption from you that sells this new product to the unsuspecting public. If you've got a great idea for a caption for this new product ad, share it here using the Comments window of my blog. I'll pick a winner on Friday, December 14, 2012. Thanks to Julie Zickefoose for being in the photo. I'm not sure if her face is revealing worry or relief. Gentlepeople: start your caption engines! 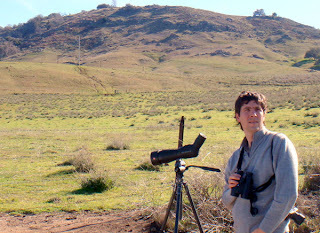 Bill Thompson III is the editor of Bird Watcher's Digest by day. He's also a keen birder, the author of many books, a dad, a field trip leader, an ecotourism consultant, a guitar player, the host of the "This Birding Life" podcast, a regular speaker/performer on the birding festival circuit, a gentleman farmer, and a fungi to be around. His North American life list is somewhere between 673 and 675. His favorite bird is the red-headed woodpecker. His "spark bird" was a snowy owl. He has watched birds in 25 countries and 44 states. But his favorite place to watch birds is on the 80-acre farm he shares with his wife, artist/writer Julie Zickefoose. Some kind person once called Bill "The Pied Piper of Birding" and he has been trying to live up to that moniker ever since. Copyright © 2005-2013 Bird Watcher’s Digest. All Rights Reserved. Dude: If you use images or text from this blog without asking, that makes you a bad person. We report ALL bad people to Santa, the Easter Bunny, the Tooth Fairy, and to anyone else who will listen. Ask nicely to use our stuff, and we'll probably say yes. Report errors to the webmaster (like she doesn't already have ENOUGH things to worry about).